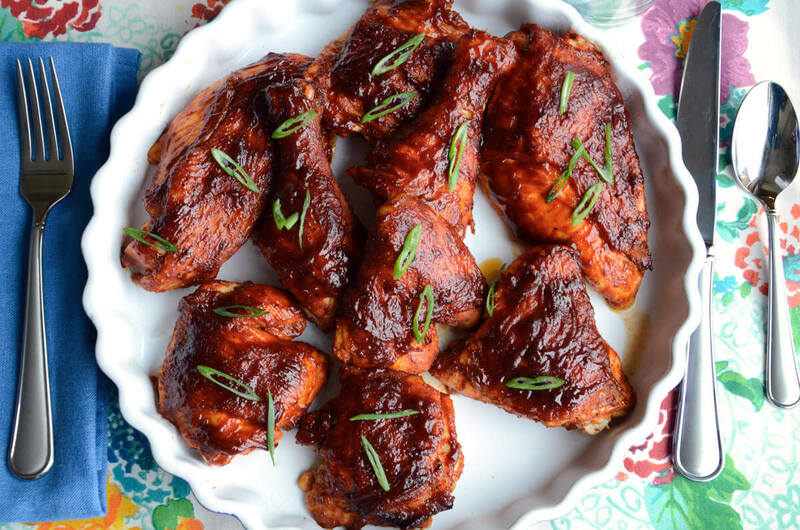 This is an easy weeknight dinner and it is “finger lickin’ good!” The sweet and tangy BBQ sauce here comes from a recipe that Chef Alex Guarnaschelli attributes to her mom. Make a whole batch of this BBQ sauce and keep it in your fridge for lots of other meals, like wings, or burgers. If you don’t have time to make this BBQ sauce, you can always use one of your favorites. In a medium saucepan or a large high-sided saute pan, combine the ketchup, cider vinegar, Worcestershire sauce, soy sauce, light brown sugar, dark brown sugar, dry mustard, Dijon mustard and chili powder. Whisk to blend. NOTE: This makes a BIG batch of sauce. Add the ginger, garlic and lemon slices and stir to combine. Simmer until the vinegar mellows slightly and the flavors start to meld together, about 20 to 25 minutes. Remove from the heat and allow to cool. Discard the ginger pieces. Coat the chicken pieces in about 1 ½ cups of BBQ sauce (in a bowl). Place chicken pieces on a parchment or foil lined baking sheet. Cook for 40-50 minutes until the chicken is cooked through. You can feel free to flip over in the middle of the cooking.